In Valkeakoski, Finland, protesters closed the access to the mine by locking themselves on the road on early morning January 2nd 2019. The aim was to stop the preparatory works at the mine. The nonviolent civil disobedience action was organised by Pelastetaan Kaapelinkulma (Save Kaapelinkulma) movement and supported by Hyökyaalto network. The protest demanded authorities halt operations of Dragon Mining in the area until future effects of the mine to groundwater and waterways have been properly investigated. The area is not covered by the municipal water system and thus, the residents are dependent on clean groundwater. Wells running dry and pollution of the waterways have serious consequences to the people’s lives. Save Kaapelinkulma movement reminds about the initiative to Regional State Administrative Agency (AVI); people in Valkeakoski have required a review to the environmental permission. The initiative demands investigation of groundwater impacts, dust and noise impacts, and the harms of arsenic in stone. The initiative was dismissed by AVI and proceeded to administrative court. The movement considers discoveries of possible springs significant. The environmental permission of Dragon Mining does not take into account existence of the springs and the company does not have permission to destroy them. The demonstrators emphasize that if the officials would take seriously the environmental impacts, they would not trust in information about the springs delivered by a company that is known for its environmental offenses. Instead officials would stop the activities and organize an independent geologist to study the existence of the springs. After christmas Dragon Mining created a fuss by suggesting in Hong Kong stock exchange that it can mine the area before the complaints are dealt in the court. According to Save Kaapelinkulma movement, this kind of speech reminds about the ruthless methods and indifference towards environment of the company. The company has been gotten caught for various environmental permission offenses and environmental crimes. Dragon Mining’s mine in Orivesi, Finland, lost its environmental permission in 2015 because of polluting the nearby waterways. However, the company has been able to continue its operations with outdated permission by complaining about the decision to courts. Last summer an illegal rubbish dump was found in the mine and that the dump had been in use for years. Although actual mining activity has not started yet in Valkeakoski, Dragon Mining has already committed petty crimes. In autumn 2017 it was revealed that the company had cut trees in Kaapelinkulma against its environmental permission. Endangered woodland brown butterfly (Lopinga achine) lives in the area. Save Kaapelinkulma movement considers officials’ activities problematic because business benefits are put before environment and residents. The mineral strategy of Finnish state has set a goal to grow the quantity of mining ores 17-fold during 2000-2020. The movement wants to raise general concern about the fact that only for 300 kilograms of gold that serves financial speculators, the company and officials are ready to destroy Kaapelinkulma and ruin the groundwater needed by the residents. The demonstrators want to show example how people will organize against extractivist multinational companies if official monitoring and legislation cannot interfere to companies’ questionable activities. 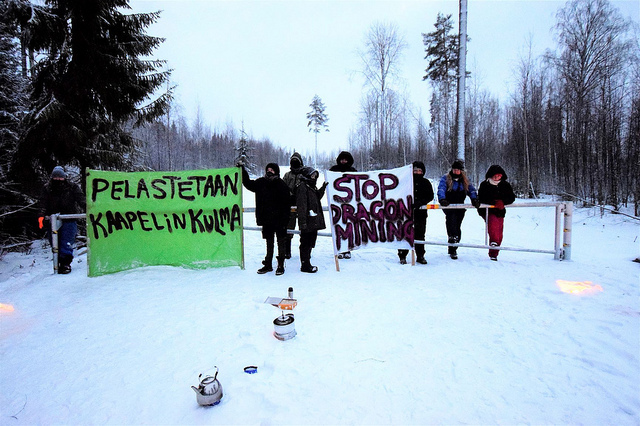 Save Kaapelinkulma movement is comprised of concerned people who want to protect Kaapelinkulma in Valkeakoski from the harmful environmental effects of Dragon Mining’s gold mine.